The Earth spins around once every 24 hours on its axis, creating the continuous cycle of day and night. 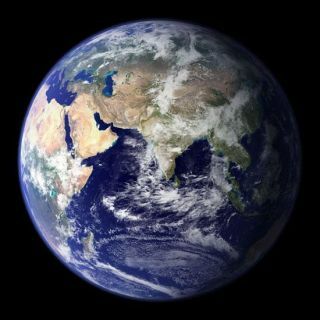 But this rotation isn't as straightforward as it sounds: Forces large and small cause the Earth to wobble as it spins. This wobbling can pose a problem for navigation systems like GPS. Scientists working with lasers and mirrors are refining a new system to track the Earth's rotation and its kinks. The pull of gravity from the sun and the moon contribute to the planet's wobble. So do variations in atmospheric pressure, ocean loading and the wind, which change the position of the Earth's axis relative to the surface. Together their effect is called the Chandler wobble, and it has a period of 435 days. Another force causes the rotational axis to move over a period of a year. This "annual wobble" is due to the Earth's elliptical orbit around the sun. Between these two effects, the Earth's axis migrates irregularly along a circular path with a radius of up to 20 feet (6 meters). Pinning down the overall wobble of the planet's rotation is key to keeping certain tracking systems accurate. Currently, this is now done through a complicated process that involves 30 radio telescopes around the globe that measure the direction between Earth and specific quasars, a type of galaxy that is assumed to be stationary relative to the Earth. In the mid-1990s, scientists of Germany's Technische Universitaet Muenchen and Federal Agency for Cartography joined forces with researchers at New Zealand's University of Canterbury to develop a simpler method for tracking the Chandler wobble and annual wobble. "We also wanted to develop an alternative that would enable us to eliminate any systematic errors," said Karl Ulrich Schreiber. "After all, there was always a possibility that the reference points in space were not actually stationary." The scientists had the idea of building a ring laser similar to ones used in aircraft guidance systems – only millions of times more exact. "At the time, we were almost laughed off. Hardly anyone thought that our project was feasible," Schreiber said in a statement. Yet at the end of the 1990s, work on the world's most stable ring laser got under way at Wettzell Geodetic Observatory, in the Bavarian Forest of southeast Germany. The installation includes two counter-rotating laser beams that travel around a square path with mirrors in the corners, which form a closed beam path (hence the name "ring laser"). When the assembly rotates, the co-rotating light has farther to travel than the counter-rotating light. The beams adjust their wavelengths, causing the optical frequency to change. The scientists can use this difference to calculate the rotational velocity the instrumentation experiences. "The principle is simple," Schreiber said. "The biggest challenge was ensuring that the laser remains stable enough for us to measure the weak geophysical signal without interference — especially over a period of several months." With some tweaks to the system, the researchers have succeeded in corroborating the Chandler and annual wobble measurements made from the radio telescopes. They now aim to make the apparatus even more accurate, enabling them to determine changes in the Earth's rotational axis over a single day. The scientists also plan to make the ring laser capable of running continuously for a period of years. "In future," Schreiber said, "we want to be able to just pop down into the basement and find out how fast the Earth is accurately turning right now."